Yesterday I gave a talk at my university’s teaching innovation symposium on using gigapan and photosynth technology for providing and alternate learning experience for mobility impaired students who have difficulties undertaking geological fieldwork. As a potential teaching innovation for myself, and because I was going to be talking about using images at multiple scales, I thought it would be a good idea to experiment with Prezi rather than using a traditional PowerPoint presentation. I also thought it might be a good idea to blog my first impressions. For those who are unfamiliar with Prezi, instead of having a number of individual slides, one has a single canvas on which all elements are arranged and a motion path is constructed between the elements. The presentation then follows the motion path, panning, rotating and zooming between the elements as necessary. This generates a smoother, virtually seamless presentation and this appeared to chime well with the zooming and panning of gigapan, and the theme of the talk that any alternative fieldwork experience must mimic the way in which geology students should approach an outcrop – overview first, the move in, examining features in detail around the outcrop, and then zooming out to reassess the exposure at a large scale. The Prezi interface is quite intuitive following some simple tutorials with the placing and sizing of images and text. The presentations can be compiled on-line via their website for free (with a larger file storage allocation if you are in education) or they can be done off-line via a paid-for application. However, since there is a free 30-day trial of the off-line programme, I opted to try that. The basics are straight forward but I did find a few issues that did annoy me slightly. However, please bare in mind that I was using the software for the first time and I was under time pressure to write the talk quickly. What is not highlighted in the overview tutorials, but I did find in the ‘known issues’ section of the website only after I had written about half the presentation, was that the maximum permitted image size is 2880 pixels. Prezi will quite happily allow one to upload an image larger than this without any warning and issues only show up later when trying to show the presentation. Because many of my raw image from my Canon 5D are 4368 pixels I had to go back through the presentation, remove all the oversize images, resize the originals and insert the new copies. What I wanted to achieve was an effect where I had an overview of an image and then zoom into some small text inserted over an important feature, to highlight it. This works well except when the text is below a certain size. In such cases, the background image disappears leaving just the text. Whilst I can see that in some cases this might be useful, it wasn’t the effect that I was trying to achieve and there seemed no way that I could control the level at which the image disappeared. The only thing that I could do was to enlarge the text or extend the line length until the image remained in the presentation by trial and error. This resulted in having some text on the images that was larger than I really wanted. Also the image vanishing wasn’t consistent. To rearrange things on the canvas, one can group them, move the group and then delete the group container leaving the moved elements. However, sometimes just moving an image with its text will cause an image to disappear when it remained before it was moved. Also, non-disappearing images in the off-line presentation would vanish when the presentation was uploaded onto the on-line site for sharing. This inconsistency was infuriating as I knew the effect I wanted to achieve but it was very frustrating getting it to work, testing the presentation over and over again. I also had to check that it also all worked at the resolution of the projected image as well as that when just editing on the laptop at a higher resolution. Our university has only recently upgraded its wifi network. They have done a very good job (I can now connect to it on my iPhone for example where I couldn’t previously as it used a java login applet) but presenting in an unfamiliar room I wanted to not risk possible network issues and have every thing embedded in the presentation. Consequently, I used Camtasia to capture some demos of gigapans on the web and in Google Earth. Theoretically, the off-line version of Prezi can take a uploaded video file and then insert a converted file into the presentation. I simply couldn’t get this to work irrespective of which video format I tried to save the files in. I then tried uploading the videos to YouTube (successfully) and then insert these into the presentation as I had seen in the demonstrations. However, this would appear not to work using the off-line version. So I uploaded what I had of the presentation onto the Prezi website and then tried to insert the YouTube clips into this. This also failed to work. By now I was running out of time. I had a half finished presentation and not much time left to complete it. I made the decision to put my trust in our IT people and their new wifi network, and break out of the presentation to run the gigapan, photosynth and Google Earth demos live. My trust was rewarded and everything worked on the day but there was more faffing about swapping from presentation to chrome, Google Earth and back than I would have liked. I have subsequently discovered that if you enter the YouTube short URL as you are prompted to do by Prezi, this doesn’t work, but if you use the long URL from Camtasia or the advanced options from YouTube, it does. Consequently, I have now embedded some short clips into the presentation below. When it came to the presentation there were a few issues too. First, I like to walk about a lot when I present and use a remote control device to advance sides. However, all this does in Prezi is to zoom in or out of the canvas. I had to stand by the laptop on the lectern to advance the presentation manually. The layout of the room was such that the computer console lectern was one side of the room and the projection screen was the other. It was also very side on so I couldn’t easily see the projection screen from where I was giving the talk so I spent far too much time looking as the computer screen and not interacting with the audience. Manually advancing the presentation is done using the arrow keys. However, I am very used to PowerPoint where the advance can be done by hitting the space key, which is much easier. Unfortunately, in Prezi this swaps from presentation to edit mode. I did this several times by instinct and it did disrupt the flow of my talk. I am also very accustomed to the presenter view in PowerPoint where you can see the next side coming up as well as the current one on the screen of the presentation laptop. This really aids the flow of my talks now and a couple of times I was a bit lost without it. Would I use Prezi again? Very possibly. The effects are good and the presentation does stand out from the PowerPoint fatigue. With a little more practice and in a lecture theatre with a better layout I think the talk could have gone better. However, the inability to use the remote, pace about, interact with the audience and know what was coming next did hinder my delivery. Despite the greater complexity and fiddliness of putting a talk together I would probably use this again for conference presentations as I think the presentation did stand out, but for day-to-day lecturing use I’m sticking with PowerPoint. PowerPoint also allows the easier creation of lecture notes for students. You can judge the results here. Obviously, there is no audio with this presentation but you should get the general idea. This week I presented some work in progress on the use of gigapan and photosynth to assist mobility impaired geology students at the “Overcoming Barriers to Learning in the Geosciences” meeting of the Geography, Earth and Environmental Sciences (GEES) subject centre of the Higher Education Academy (HEA). The main aim of our MIS:TIQUE project (mobility impaired students : teaching in quite unsuitable environments) is to provide alternative technologies for mobility impaired students so that they can attain an equivalent learning experience to the able-bodied in geology fieldwork. Gigapan and photosynth allow us to mimic the observation patterns that we would like all students to use. This involves starting with an overview to develop hypotheses to what might be going on, moving in and around the outcrop to make more detailed observations and test the hypotheses, and then move back out again to revise the overview. I’ve blogged briefly about this structure before here in my list of places that all geologists should visit in the UK. 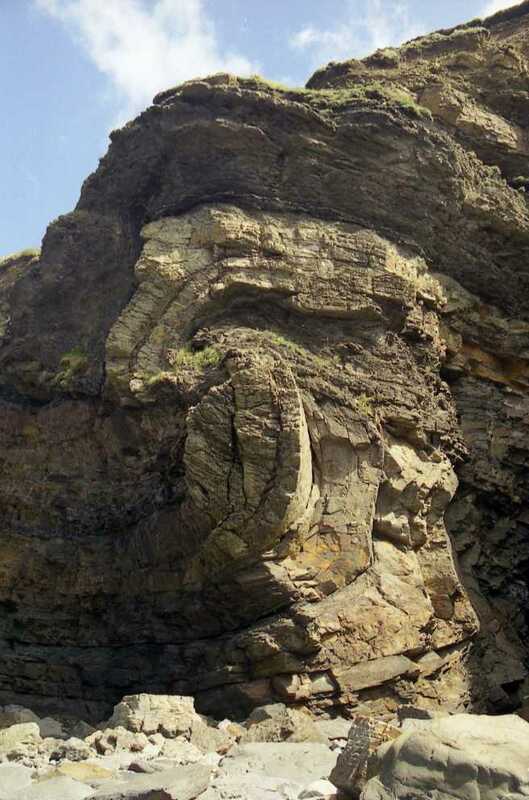 It is the quite spectacular Variscan fault propagation fold and Broadhaven, Pembrokeshire, Wales. As the thrust in the middle of the section propagates up through this sequence of Upper Carboniferous sandstones and mudstones it folds them ahead of the thrust tip. Eventually, the thrust cuts through the fold, separating the hangingwall anticline from the footwall syncline. 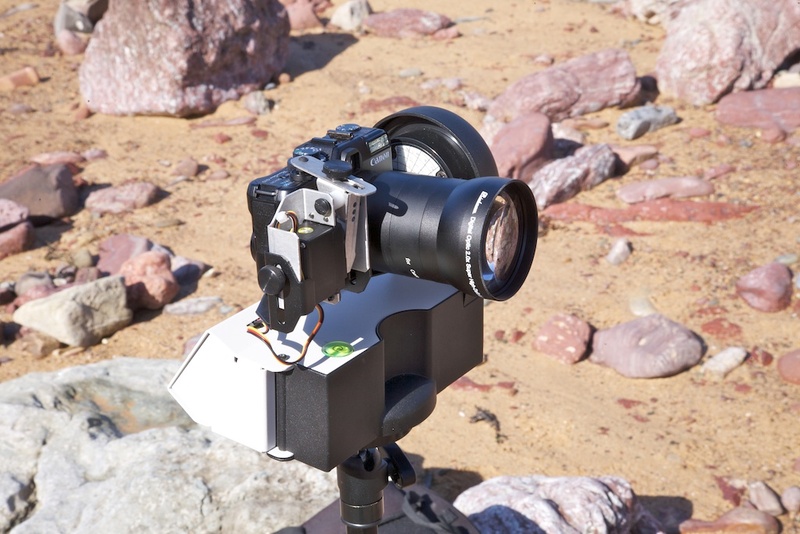 I’ve already previewed our MIS:TIQUE project, attempting to use gigapan technology to help provide alternative geological learning experiences for mobility impaired students. I am giving a presentation on this topic at Keele University’s annual teaching innovation day on Friday so I’ve been working on the data that was collected over the Easter vacation. One of the main reasons in getting my own domain and hosting this blog myself was the previous inability to insert gigapans and the like into blog posts when using wordpress.com – with a hosted version of wordpress this is now possible. A full screen version can be found here. This is one of the two gigapans than I have shot of this structure. This was shot hand held with my Canon 5D and stitched using Canon stitching software. I was experimenting a bit with this one just to see what it would turn out like with automatic focus and exposure. I think it turns out quite well and is sharper than the one I took with the Canon G10 on fixed focus and exposure and using the gigapan robotic mount which you can find here. I also experimented by uploading all of the images from both cameras into photosynth, and again I’m quite pleased with the results which can be seen below. The full photosynth can be found here. I bring you a preview of my latest project – MIS:TIQUE – Mobility Impaired Students : Teaching In Quite Unsuitable Environments. Universities in the UK quite rightly have been improving teaching and learning for students with disabilities. Most of the work has concentrated on topics like dyslexia and learning disabilities but little work has been done for mobility impaired students beyond installing ramps and lifts. The building I work in now has expensive lifts to all parts except the one corridor that can’t be reached on the flat. However, geology has an almost unique issue for mobility impaired students, fieldwork. I have noticed a dramatic increase in mobility impaired students over the last ten years. When I took my geology degree over twenty-five years ago geology was considered to be (although not exclusively) something of a ‘macho’ subject. Most of us who took the subject were ‘outdoor’ types into walking, climbing, caving, etc. and most of us wanted to be vocational geologists. Today it is a very different landscape. Geology is no longer (I hope) a macho subject. Indeed, now the majority of our students are female (Note that I’m not saying that females are immobile in the field, just that the type of geology graduate has changed dramatically). Students chose geology as they would any other degree subject and many are unused to the great outdoors. Students with disabilities are rightly encouraged in taking degrees (which is good), I encounter more students with asthma who have problems walking in hilly terrains (which is unfortunate), and more students are simply unfit and/or obese (which is not good). For other subjects, such as geography for example, I would argue that it is easier to reorganise a field course to suit disability impaired students. However, in geology where the important exposures are typically at the far end of a rocky beach, on the end of a peninsula or up a mountain it is extremely difficult to run a field course without degrading the experience for the vast majority of able-bodied students and/or incurring great additional costs. Under the Special Educational Needs and Disability Act 2001 (SENDA) we are required to ‘make reasonable adjustment’ or provide an ‘equivalent educational experience’. What this might be is a moot point if ever there was one. There are many who would argue (myself included) that geological field work is integral to a geology degree, it being the part where we can bring together all the threads of geology and start to make the subject make sense to the student. One potential solution is for the mobility impaired student to guide a person with a video camera over a two-way connection to examine the particular features. In the places we visit this would almost certainly necessitate satellite communication and would be prohibitively expensive and a logistic nightmare. The way we teach students to undertake field geology is first to stand back from the outcrop and (after making a hazard assessment) try to work out what is going on. 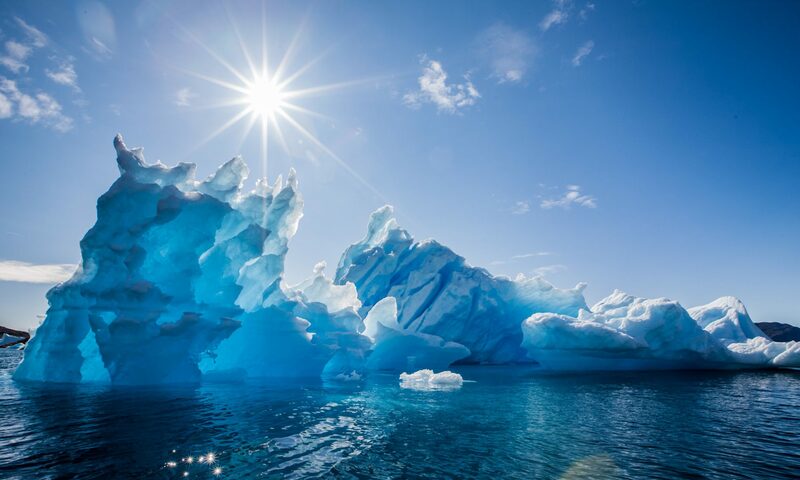 From their initial observations they can erect some hypothesis regarding what might be going on and devise some ways in which they might be tested. They then move in to the exposure, make some detailed observations around the outcrop, and test the hypotheses they have come up with. They then move back to the initial point for a revised overview based on the detailed observations they have made, returning to the exposure if necessary. The idea of the MIS:TIQUE project is to try to mimic this process using gigapan technology and back this up with other web based learning materials. Using gigapan, we can start with an overview, move in for detail, pan around the exposure and then zoom back out for the revised overview. As I run a first year geology field course to Pembrokeshire in South Wales I have been back there last week with a few of my geology colleagues to shoot some gigapans and devise some virtual field exercises which, whilst can in no way replace the field experience of able-bodied students, might at least go some way towards reasonable adjustment for the mobility impaired. 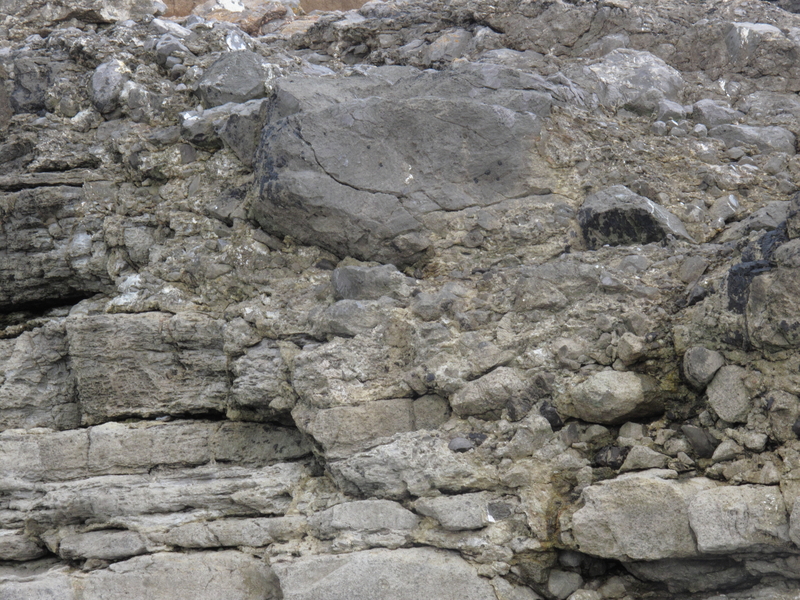 As a taster, we stopped off on the way to Pembrokeshire to visit Ogmore-by-Sea, near Bridgend in South Wales to look at the Lower Carboniferous Limestone which is cut by Triassic Wadis in-filled with limestone breccias. A close-up picture of the wadi margin is shown above and the gigapan can be seen here (wordpress.com doesn’t seem to allow gigapan embedding).